A sunken amphitheater holds up to 200 people as a central gathering space for presentations and performances. 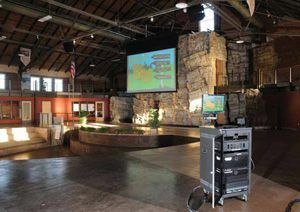 FORT SNELLING, MN—Technicians for Alpha Video and Audio found installing modern audio and video systems in a building built in 1907 as a place for the Army to train cavalry horses not only a challenging experience, but also a rewarding one since the project was for the Boy Scouts of America. The Cavalry Drill Hall is located in the National Register Historic District of Fort Snelling, MN and was sitting empty when the Northern Star Council of the Boy Scouts of America voted to purchase it in 2008. Even though the building had a dirt floor and lots cobwebs, the council envisioned a first-in-the-nation “urban base camp” that would support its vision to be recognized as a positive influence on the lives of the youth in the communities it serves. Once the council had purchased the building and six acres, it started planning with LH B architectural company on how to renovate the building. The goal for the renovation was two-fold: to restore the red brick building back to its original historic appearance and to build a program facility that could be used by not only the Boy Scouts, but other youth organizations, local schools, and community groups. The facility features a natural rock face indoor climbing wall, two outside climbing walls, indoor and outdoor rope challenge courses, and a NASA Space Shuttle simulator. But, to attract community events, a presentation and meeting area was needed. Commenting on amenities for events, Clint Andera, IT director for the council said, “We incorporated a sunken amphitheater to the facility that holds up to 200 people as a central gathering space for presentations and performances. A top-of-the-line audio and video system would be important to making this space a success. We also needed an effective sound system for the entire building.” The council hired Alpha Video and Audio in Edina, MN to install the audio and video systems for the facility. To keep the facility flexible for presentations, the original plans for the presentation system include a 52-inch monitor on an AV cart that could be easily relocated and connected to one of five video distribution points. But, two weeks before the grand opening, the council re-evaluated the AV requirements and determined that an electronic drop-down screen and projector would benefit the facility. The final AV systems include a 52-inch LG Electronics LCD monitor on a Chief mobile cart, a Christie Digital 6500-lumens LW650 projector, a Da-Lite 120- x 190-inch Cosmo screen and two Kramer 9-input switches. Four Electro-Voice EVF 1122 loudspeakers are arrayed above the amphitheater and six pairs of EV SX100+ speakers are hung throughout the rest of the building. Alpha Video programmed a Crestron CP2E system with one TPS -6X touchscreen panel to control the video systems and route the audio to some or all of four sound zones.